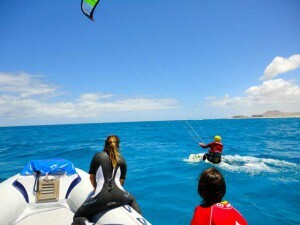 You would like to learn how to kite or to improve your kiting? During a Kitecourse you can learn everything, no matter if you are a beginner or intermediate, our licensed instructors teach you everything. We start the Kitesession at the Beach. There you learn how to steer the kite, how to start it, to position it the right way. Once you are able to control the kite safely it is time to go into the water. At first you will learn how to body drag. Once you reach level 3 we will drive out by boat and learn to water start with your board. At first we start again practicing the body drag, that you get the feeling for your kite. Following you have time to practice your kiting as much as you want, and with our coaches always ready to help and give helpful tips.